This month, EPA Administrator Scott Pruitt announced plans to repeal the Clean Power Plan, an Obama-era policy to regulate greenhouse gas emissions from power plants. The Clean Power Plan is the federal centerpiece of US domestic policy to allow the country to uphold its commitment under the Paris Agreement. Although the Clean Power Plan never went into effect (it was temporarily blocked in the Supreme Court in 2016), many states had already begun shifting their energy mix towards renewables due to economic factors and local clean energy policies. The Clean Power Plan seeks to regulate greenhouse gas emissions, including carbon dioxide. According to the results of our May 2017 Politics and Global Warming survey, regulation of carbon dioxide as a pollutant garners support from 77% of registered voters. This policy is supported by majorities from all political parties, including 57% of Republicans, 75% of Independents and 94% of Democrats. One of the main criticisms of the Clean Power Plan has been that it may raise electricity costs. The EPA estimated that the Clean Power Plan would cost $8.4 billion, but by 2030 it would return an estimated $34-54 billion in climate and health benefits. We asked a nationally representative sample of Americans about key aspects of the Clean Power Plan, including regulation of coal-fired power plants and cost, and found some interesting results. Our research revealed that 69% of registered voters support setting strict CO2 limits on existing coal-fired power plants, to reduce global warming and improve public health, even with the explicit caveat that the cost of electricity to consumers and companies would likely increase. This policy was supported by 90% of Democrats and 67% of Independents. However, support from Republicans on this policy hovered at 46%, just below a majority. This leaves one wondering: Exactly how much are Americans willing to pay for carbon reduction policies? 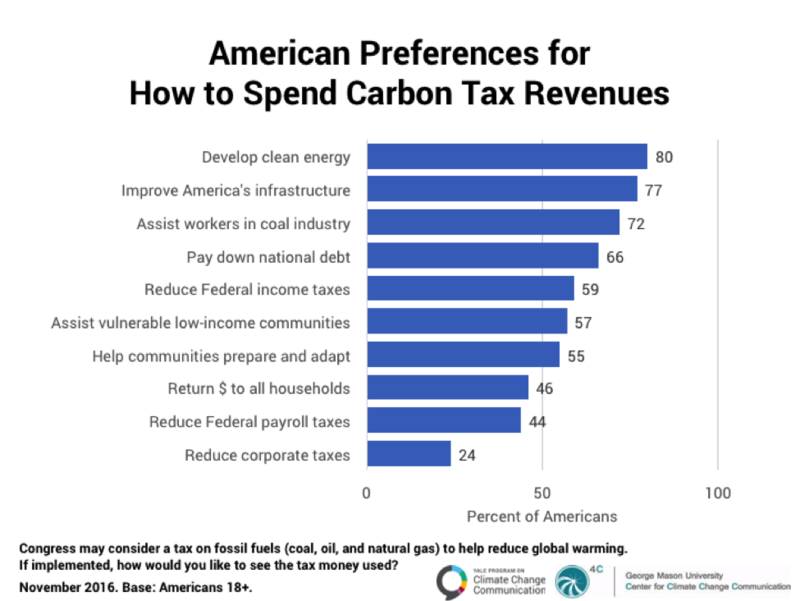 As it turns out, we know how much Americans are willing to pay for carbon reduction policies. American households are, on average, willing to pay 14.4% more on their energy bills to support a carbon tax to reduce global warming. This translates to approximately $177 per year per household on energy bills and accrues to $22.3 billion in annual tax revenue. When survey respondents were asked what they would like to see the tax money used for, they were given 10 options to chose from, including returning the money to households equally. 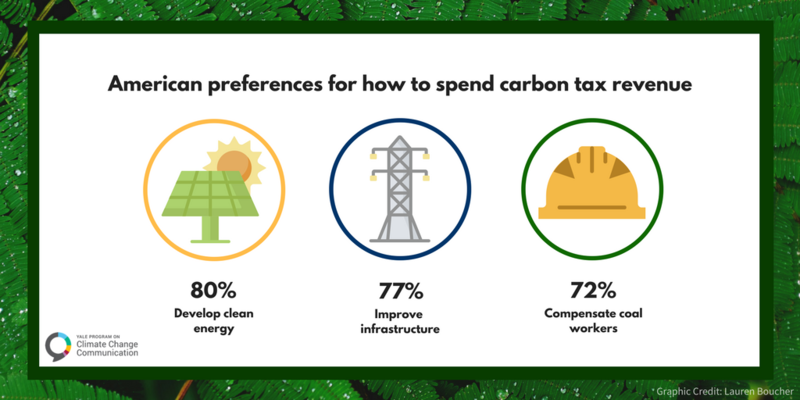 Overall, the highest preference was for using the tax revenue to develop clean energy like wind and solar (80%), improving America’s infrastructure (77%), or assisting coal workers who may lose their jobs as a result of the tax (72%). These findings offer hope for the environment and carbon reduction policies, especially after the announced cancellation of the Clean Power Plan. The Supreme Court ruled that the EPA is obligated to offer a replacement plan to regulate CO2 emissions if the Clean Power Plan is repealed. However, the EPA currently has no replacement policy prepared, and instead plans to seek public comment on how to reduce emissions from coal-fired and natural-gas power plants. Hope lies in the fact that support exists among America’s voters to potentially replace the Clean Power Plan with something stronger. While policymakers consider crafting a replacement for the Clean Power Plan, the data shows there is bipartisan support for carbon reduction policies, including a carbon tax, even if costs increase for individuals or utilities. Fund more research into renewable energy resources such as solar and wind (86% of all registered voters: 76% of Republicans, 82% of Independents, 95% of Democrats). Provide tax rebates for people who purchase energy efficient vehicles or solar panels (84% of all registered voters: 74% of Republicans, 82% of Independents, 95% of Democrats). The U.S. should reduce its greenhouse gas emissions, regardless of what other countries do (68% of all registered voters: 51% of Republicans, 71% of Independents, 84% of Democrats).